Little Lady Luxury: Bubbles My Bubbles! 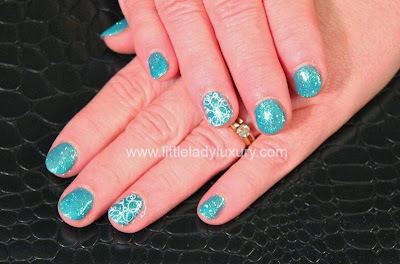 Ive got another gel manicure for you today! This Gelish manicure was done on my lovely friend Joan - she needed a little sparkle in her life and this was just what she needed :) This is a base of Ooba Ooba Blue with custom glitter embedded on top. Last we finished off the ring fingers with accent bubbles done with Konad White Stamping polish and Mash 43 stamping plate. Hope you like it!